In all the Sturm und Drang of the really incredible events of the last 18 months in the world of comics it is only now occurring to me that the main thrust of almost all of the really and truly great "Event" stories have been steeped in Sci-Fi themes and Cosmic execution. Between the New Gods angle of Final Crisis, the Skrulls of Secret Invasion, and the whole of War of Kings and Blackest Night the world of comics has been looking to the stars in a big way for the last 2 years or so. And consequently they have been creating a whole lot of really great comics that both fans of super-heroes and space operas can truly appreciate. Writers like Tony Bedard, Dan Abnett & Andy Lanning, Geoff Johns, Peter Tomasi, Grant Morrison, Brian Michael Bendis and others have been given the chance to talk about the oft overlooked corners of the greater universes of both DC and Marvel Comics. 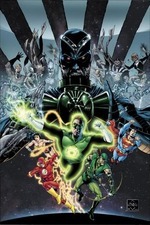 Starting back in 2005 when Geoff Johns kicked off the reinvigoration of the Green Lantern franchise and Keith Giffen launched the Annihilation event at Marvel that introduced a whole new generation to Silver Surfer, Nova, Drax, and Thanos. In the intervening 5 years we have seen a great deal of new series launch that have been cosmic based and space has never looked brighter in the world of major comics publishing. And while many of them have developed rabid, hungry fan bases it seems like the really great titles often go overlooked, and so I decided that with my podium here on the front page I would let you know about some of the creators and comics that have been keeping the Sci-Fi nerd in me thrilled month in and month out (and I'll even talk about some of the lesser known titles that might be flying under your radar). Dan Abnett and Andy Lanning have been working together for the better part of 2 decades having worked on such seminal books as 2000 AD's Judge Anderson (a spin off character from the much more well known Judge Dredd) and The Legion of Super Heroes, but their recent works have held the rapt attention of a great portion of the comics community and perhaps deserves even more notice. Both of their ongoing series: Nova and Guardians of the Galaxy spun out of the events of Annihilation and both books are incredibly good. Nova has a much more serious feel and carries the feel of a Green Lantern Corps style book in the Marvel Universe, but for most of the series Richard Rider (Nova) has been alone in his efforts as he tries to slowly and deliberately rebuild the Nova Corps. The events of War of Kings created the greatest need for an expanded Nova Corps and so as the series progresses into the Realm of Kings era the book has taken on a larger cast and that is exactly the kind of thing that allows Abnett and Lanning to shine even brighter. No further evidence is needed of this simple fact than their other ongoing series, Guardians of the Galaxy. Put together by necessity rather than desire the Guardians banded together by Star Lord (who helped to stop the terrifying events of Annihilation) in order to undermine the efforts of the the Phalanx during Annihilation: Conquest. The series plays a lot like an intergalactic A-Team and has an incredibly unique story telling style where the events are narrated by the characters as part of their after-action reports. The series features a bizarre cast of characters that have incredible chemistry and manage both the action and the humor of the series with great class. Another writer who is great with ensemble stories is Tony Bedard who really made his name when it comes to sci-fi story telling with Negation at CrossGen comics. His experience there spun into working on Exiles at Marvel and a few things here and there before he started work on another great space faring ensemble series for DC Comics: R.E.B.E.L.S., a book that benefited more from it's inclusion in the events of Blackest Night than any of the other so-called "Ring Books". R.E.B.E.L.S. follows the adventures of Vril Dox, also known as Brainiac-2, the former leader of the intergalactic Police-for Pay agency L.E.G.I.O.N. as he runs from the agents of the agency he once rain. Along the way he has encountered former agents as well as former enemies who have joined in his quest to regain the control of his agency. In his travels he has also come across an army of mindless soldiers controlled by Starro the Conqueror, who is apparently not the giant starfish we all though we knew, but is a warrior king from another galaxy that has overtaken planet after planet and with every new mind controlled he becomes even more powerful. They have also encountered the innumerable forces of the Black Lanterns during Blackest Night. Further proof of Bedard's skills are only made more evident with the recent announcement that after the end of the Blackest Night a third Green Lantern ongoing series, Green Lantern: Emerald Warriors which will be written by Peter Tomasi and Tomasi will in turn be leaving Green Lantern Corps ... on which Bedard will take up writing duties. Be they space faring or earth bound there are a great number of other great sci-fi series being published by companies large and small, the adaptation of the Ender Wiggin series by Marvel comics or the continued adventures of the crew of the Farscape at BOOM! Studios even books like King City at Image, Resurrection at ONI, the Soleil publications released by Marvel (Sky Doll, Universal War One, Kookaburra K, and Scourge of the Gods chief among them), or even the great anthology series 2000AD. It couldn't be a better time to be a sci-fi nut in the comics world.